Updated: July 12, 2017 at 07:51 p.m. The National Football League has a strength of schedule formula that's simple to understand ... take the opponents' records from the previous season, add up wins and losses and calculate a percentage. In fantasy football, there's a different method that evaluates a player's value. Instead of team records, we use the number of fantasy points surrendered by opponents the previous year against a single position. For example, the Green Bay Packers allowed an average of 28.94 fantasy points per game to running backs in 2016. As a result, any running back who faces them in 2017 receives 28.94 points. The bigger the overall point total, the easier the schedule. While these ratings are not the be-all, end-all in determining a player's stock, owners can use them when picking between players with similar value and projecting potential sleepers or busts. 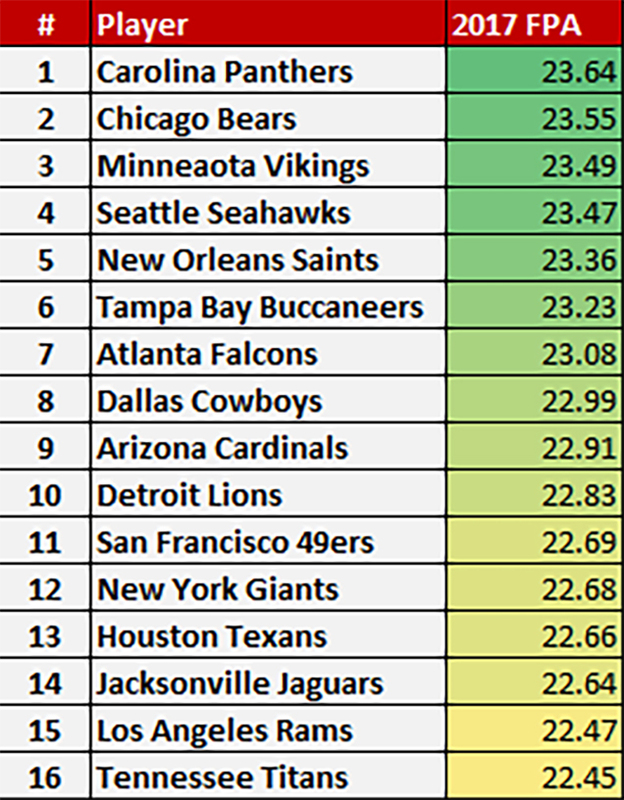 Notes (1-16): The difference between the best schedule (23.64) and the worst (21.22) is not excessive this season. Furthermore, it's less than a one-point separation from No. 1 to No. 16. ... The NFC South is dominant atop our list, as the Carolina Panthers, New Orleans Saints, Tampa Bay Buccaneers and Atlanta Falcons all rank seventh or higher. That's due in part to the fact that all four teams were in the top half of the league in terms of allowing the most fantasy points to wide receivers last season. The division also gets to face the Green Bay Packers, who allowed the most points to the position. That's good news for Julio Jones, Mike Evans, Michael Thomas and Kelvin Benjamin. ... The NFC West also has a favorable slate, with all four teams ranked in the top 15 in terms of the easiest schedules. The division itself fields three teams (Los Angeles Rams, San Francisco 49ers, Arizona Cardinals) that were eighth or higher in allowing the most points to the position, which is an advantage for the likes of Doug Baldwin, Larry Fitzgerald and Pierre Garcon. ... Studs like Dez Bryant (No. 8) and Odell Beckham Jr. (No. 12) have favorable slates, as do bounce-back candidates Allen Robinson and DeAndre Hopkins. Notes (17-32): The bottom of the wideout rankings include two AFC West teams (Kansas City Chiefs, Los Angeles Chargers), and all four are in the bottom half of the league. Keep in mind, though, that even the Chiefs (No. 32) are just 1.13 fantasy points behind the middle of the pack Tennessee Titans (No. 16). ... Brandin Cooks and the New England Patriots rank at No. 28 at the position, which is due at least in part to matchups against the aforementioned AFC West. 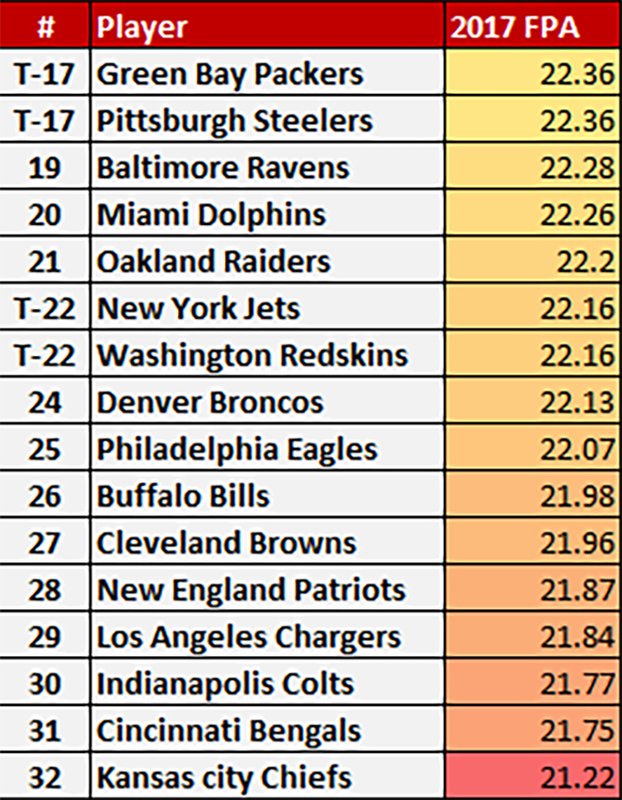 In all, no AFC East team has a rank higher than 20th based on fantasy points allowed at the position. ... The AFC North also has a difficult slate, with two teams (Cincinnati Bengals, Cleveland Browns) ranked in the bottom five. Again, however, remember that the difference between the bottom 16 teams isn't excessive based on 2016 totals.